Have last month’s bills arrive at your house yet, or does your husband still speak to you? When I dropped by the Burns house this morning, Gracie was wondering how to break the bad news to George. Gracie Allen: Oh Bill, I’ll have to get George in an awful good humor before I let him see these Christmas bills. How can I do it? Bill: Let’s see. Wearing one of those slinky lace negligees oughta please George. Gracie: No! He’d look terrible in it. Bill: Gracie, I meant for you to wear it, not George! Put the bills on a table and stand beside him in your negligee. Gracie: It’ll never work Bill, we’ve been married too long. Gracie: He’ll notice the way the bills are stacked, not me. Bill: Oh, you’re wrong Gracie. If George has got an ounce of blood in his veins, he’ll – yeah, I see what you mean. Gracie: Well, I guess it’s just no way that a wife could present her husband with a bill and make him like it. Bill: Not true Gracie, my mother did it and my father was happy as a lark. Gracie: She must have presented him with an awfully little bill. Bill: No, I weighed eight and a half pounds. Gracie: You know the kind of bills I mean! Now, come on, help me think of something. Bill: Well, maybe you could put George in a good humor by fixing his favorite food. Gracie: That’s right. The way to his heart is through his chest. Bill: No, it’s through his stomach, you slipped up. Gracie: It’s through his chest, that slipped down. Bill: Well, anyway Gracie. What does the little man like to eat? Gracie: Well, he adores hot biscuits. You know, he’s still got the first biscuit I made after we were married. Bill: Really? He saves funny things. Gracie: Yeah. He’s also got the first tooth he lost after we were married. Bill: Why does he save the tooth? Gracie: He can’t get it out of the biscuit. Gracie: Of course I can make wonderful biscuits now. George just drools when — say I’ve got a great idea. I’ll fold the bills up real small and bake them inside the biscuits. Bill: Oh, then when he takes a bite, he’ll discover the bill? Gracie: Right! With a mouth full of biscuit, he won’t be able to scream so loud. Bill: It’s a screwy idea, Gracie, but it might work. Gracie: Anything to soften the blow for my darling George. Bill: You really love that little schnook, don’t you, Gracie? Gracie: Oh, yes Bill. When they made George, they broke the mold. Bill: Well, better late than never. So long, Gracie. I hope your plan works! Gracie: There! The biscuits are done, now, let’s see. This one has the May company bill in it, this one has the Sachs bill, this one is the Broadway, and this – oh-oh, here comes George. I better soften him up with a little flattery before lunch. Gracie: Oh Georgie boy, you’re home from school. Gracie: Forgive me, dear. You look so young, I always think of you as going to high school. George: I don’t look like I go to high school! …College, maybe. Gracie: Your handsome face is ageless. Your noble brow, your classic features. They look like they belong on a Greek statue. Gracie: Sometimes, I’d swear your head was made of marble. George: Well, ol’ Marble-head is hungry. Hey, you got biscuits! George: Okay! Mmm that was good. Gracie: You swallowed the whole thing? Gracie: That takes care of the May company. Gracie: They can’t send a collector after that one! Gracie: Oh, nothing. Here, try the Broadway. I mean, have another biscuit. George: I’ll break this open and put some butter….There’s a piece of paper in here. Gracie: Uh-huh! There’s one in each of the biscuits. George: Oh, I get it, like the Chinese tea rooms. My fortune is in these biscuits. George: I’ll open all of them! Gracie: Yes dear, and I’ll run get you the ice bag. George: I feel fine, I don’t need any ice bag. Just pass me those biscuits. Gracie: How does the ice bag feel, darling? Gracie: Here. I buttered some more aspirin for you. George: You buttered the aspirin? Gracie: Well, as long as you were eating it like popcorn. I thought I might as well butter it. George: Gracie, look at that stack of bills! How could you buy that many Christmas presents? Where did you find them? Gracie: Oh, I just opened up my charge account and there they were. Gracie & George: You’d pay for all of them! George: [mutters something unscripted about having paper caught in his mouth] Well, you’re out of luck. I’m gonna stop being the goose that lays the golden eggs. Gracie: You mean you’re gonna stop telling jokes on the radio? George: Meredith, what would you do with the person you married spent money like a drunken sailor? Meredith: Well, in the first place, I would never marry a drunken sailor. Meredith: Though at one time, I was quite friendly with a sober WAVE. She picked me up one night at the palladium. Gracie: She picked you up? George & Meredith: …and she picked you up. Meredith: Well, one thing led to another. Before I knew it, that WAVE had me in the back seat of a taxi. During the war, I was a sucker for a uniform. George: Oh Meredith, you didn’t even know her. Meredith: I know Gracie, but I felt that I should be kind to her! After all, she’d been fighting for me. Meredith: But no sooner were we alone that she became quite amorous. Oh, she wasn’t to blame. I was attractive and she’d been at sea for a long time. George: Meredith, when you came in, I asked you one simple question. All I want you to do is answer that. Meredith: Gladly George, would you state the question again? George: What would you do if the person you married spent money like a drunken sailor? George: Gracie, suppose you start explaining these Christmas bills. Who got this $25 hat? Gracie: I gave that to Clara Bagley. I decided to break up our friendship. George: Why did you give her an expensive hat? Gracie: Well, I have one exactly like it. When she sees me with it on, then she’ll stop speaking to me. George: There must be cheaper ways to lose a friend. Here is a bill for a bushel of nuts delivered to San Francisco. Who’d you sent those to? Gracie: My mother. That was your own suggestion, dear. Every time I said what’ll we send Mother, you said nuts to her. George: I should give your mother a bushel of nuts. What’d she ever gave me? Gracie: She gave you me! I’m as good as a nut. George: You can say that again. Gracie: I’d rather not. I didn’t like the way it sounded. George: And you got this chromium chair with the plastic seat, for whom? Gracie: My brother Willy. He’s building his own house with a GI loan and he’s crazy about antique furniture. George: A chromium and plastic chair isn’t antique. Gracie: It will be by the time the house is built. George: How about this necklace? Who got that? Gracie: My sister Betsy. She needed it to hide her appendicitis scar. George: Ah…on her neck? An appendicitis scar is on the stomach. George: –had to operate up there, yes, I see it. You made that up. Gracie: Well, I was just trying to amuse you. George: Well, I’m not amused. Those relatives of yours are costing me a fortune. Here’s a bill for a pair of earrings! Gracie: Oh, well, don’t scream about those, George. I bought those for one of your relatives. George: I might have known. What do you expect me to do about these belts? Gracie: Write out checks for them! Here’s the special fountain pen you use for paying bills. George: Special fountain pen for paying bills? Gracie: It writes under protest. George: Well, I got news for you kid. I can’t pay these bills. George: Because there’s not enough money in the bank. Gracie: Ooh, don’t be silly. It says right in the window of the bank there is over 12 million dollars in there. George: I mean there’s not enough money in my account! If you overdraw your account, you can be put in jail. Gracie: Oh dear. Well, George, don’t you worry! I’ll figure out some way to settle those bills. Gracie: Well George, everything is fine, the Christmas bills are paid! George: Really? What did you do? Gracie: I used my head! You said the bank could put you in jail if you overdraw your account. Gracie: So I wrote the checks myself. Gracie: Well, they can’t put me in jail. I haven’t got an account there! George: Oh, no. Gracie, it’s even worse to write checks when you have no account at all! Now, they’ll put you in jail! Gracie: You mean I’m a juvenile delinquent? George: You’ll be worse unless you get those checks back. Gracie: But the checks are in the mail. George: Then you’re just out of luck. Gracie: Ooh, here comes the postman. He can save me, he can get those checks out of the mail. Happy Postman: Good afternoon Mrs. Burns, here is your mail. Gracie: Oh Mr. Postman, I’m in a terrible trouble. And you’re the one who can help me. Happy Postman: I love to help damsels in distress. Just as Sir Galahad rescued Guinevere from the dragon, I will rescue you. Is your husband the dragon? Gracie: A little, but he’s tired. Happy Postman: Uh…yes. How can I help you, Mrs. Burns? Gracie: By mistake, I put some bad checks in the mail, and I want you to get them for me. Happy Postman: Oh, I dare not temper with the mail. Gracie: But Mr. Postman, if I don’t get those checks back, I’ll go to jail! What if your wife were in a spot like this? You wouldn’t let her go to jail. Happy Postman: Ahaha! You say such humorous things, Mrs. Burns. Gracie: Please, can’t you think of some way I can get those checks? Happy Postman: Your only chance is to stop them when they come through the bank. Gracie: Do you know anyone who works at the bank? Happy Postman: Not now. My wife Bertha worked in the escrow department when I married her. Now, I guess, they just call it the S department. Happy Postman: I took away the crow. Gracie: Mr. Postman, that gives me an idea! I’ll go down and get a job at the bank myself, and then I can grab those checks when they come through. Happy Postman: Good luck Mrs. Burns. And remember, keep smiling! Gracie: How do you do? You’re Mr. Vanderlip, the president of this bank? Gracie: Well, I wonder if you do something for me. Mr. Vanderlip: I suppose you would like me to authorize you a loan. Gracie: I would not. Just because I am alone don’t think you can authorize me! Gracie: Do I look like the sort of girl who can be authorized? You’re wrong! I didn’t come in here to be insulted. Or authorized! Mr. Vanderlip: Believe, I meant no harm. What is the nature of your business? Gracie: Oh. Well, I’d like a job in your bank. Mr. Vanderlip: I see. In what department? Gracie: How about the check room? Gracie: I want to get my hands on some checks. I mean, I like to handle checks. Mr. Vanderlip: At what bank were you previously employed? Mr. Vanderlip: Naturally, I can check your record at any bank in United States. Gracie: …I worked at the bank of England. Mr. Vanderlip: Bank of England? Mr. Vanderlip: Were you a teller? Gracie: Not me, I jolly well kept my mouth shut. Mr. Vanderlip: Madam, I do not believe you were employed by the Bank of England. Gracie: You don’t, huh? Well, just ask me some banking questions. Mr. Vanderlip: Very well. What would you do in the case of overdraft? Gracie: Close the transom. [audience] Next question. Mr. Vanderlip: Suppose we cease this masquerade. You obviously know nothing whatever about banking. Gracie: Then I don’t get the job? Gracie: In that case, put up your hands. Gracie: This is a holdup. Mr. Vanderlip: You have no gun! Gracie: Oh. Well, let’s get back to the job. Mr. Vanderlip: Look, I am a busy man. What is this all about? Gracie: I’ve got to recover some checks I wrote on this bank. I haven’t an account here, and my husband says I’ll go to jail. Mr. Vanderlip: And so you will, unless something is done. Perhaps I could authorize you a loan. Gracie: There you go again! Gracie: When you get a girl alone, that’s all you would think about, authorizing. Gracie: And at your age! Gracie: I’d rather go to jail! Goodbye, you ol’ authorizor, you. Mr. Vanderlip: Now, let me get this straight Mr. Burns. You want to take all the money out of your bank account and open one for your wife. George: Yes. Then those checks she wrote will clear. That is, if you lend me $100 to go with it. Mr. Vanderlip: Glad to lend you $100. How about collateral? George: Why, Mr. Vanderlip! I’ve never needed collateral. I’ve gotten to where I am today on my face! Mr. Vanderlip: I believe you. It shows considerable wear and tear. George: All I need is a hundred. I’ll pay it back right away. Why, a man like me can make a hundred in no time. George: Oh hello Bill! Say, Bill, tell Mr. Vanderlip how quick I can make a hundred. Bill: No time at all, Mr. Vanderlip, his next birthday oughta do it. Bill: Mr. Vanderlip, I’m about to make a withdrawal from my safe deposit box. May I have the usual three armed guards? Mr. Vanderlip: Of course, Mr. Goodwin. George: You must have a fortune in that box! George: Could you lend me a little? Bill: Sure George, all you want! All right guards, put the box down right here. Bill: I’ll open it. Now George, how many pounds do you want? George: What have you got in there? George: But Bill, what I need is money. Bill: George, what good is money? Can money buy happiness? No! Can money buy contentment? No! Can money buy a new car? No! George: No, but it can keep Gracie out of jail! George: She wrote some bad checks, and unless I deposit some money for her, she’ll go to jail. So you can see why I need more than coffee. Bill: You’re not kidding, you need donuts too. If Gracie goes to jail, you’re gonna starve! George: Bill. I don’t need any donuts. Bill: I’ll lend you the money! Here help yourself, take all you want. George: Thanks Bill. Now Gracie won’t have to go to jail. George: Just to teach her not to sign her name to any more checks. I’ll let her she thinks she is going to jail. Bill: But George, that’s cruel and inhuman. George: It’s just to scare her. After she’s learned her lesson, I’ll take her in my arms and give her a big kiss. Bill: But George, that’s cruel and inhuman! George: So that’s it, Gracie. You’ve broken the law and now you must pay the penalty. Pretty soon a detective will come and get you. Gracie: Ooh, I hope it’s Humphrey Bogart! George: I mean a real policeman! And then you’ll have to go down and appear with the district attorney. Gracie: Wonderful! I’ve always wanted to be on that program. George: Gracie, you’re not taking this seriously. There will be a trial with the judge and a jury and you on the witness stand. Do you realize what it means to be cross examined? Gracie: Oh, sure. I cross my legs and the jury examines them. George: Gracie, stop joking about this. You know where you’ll wind up? Tehachapi. George: I didn’t sneeze, I said Tehachapi. George: Tehachapi, that’s where women go who make mistakes. Gracie: Oh, I thought they went to Reno. George: Gracie, Tehachapi is a women’s prison! And take it from me, that’s where you’re headed. Gracie: Are you serious, George? Am I really going to prison? George: You bet. When you commit a crime, they send you up the river. Gracie: Aw, but it was such a small crime. Couldn’t they just send me up the creek? Gracie: How long will they keep me there, George? Gracie: 30 years! My goodness! When I get out, I’ll be in my 40s. Gracie: You’ll come see me on visitors days, won’t you? Gracie: I’ll look forward to those moments. I’ll put my hands through the bars and run my fingers through your hair. Gracie: Let it grow long and hide a file in it. George: Nothing doing. You’ll stay there, and I hope it teaches you never to sign your name on another check as long as you live. Gracie: It will George. 30 years in prison! Gracie: Gesundheit. Oh – that’s where I’m going. There are a few last things I wanna do before they take me away. Wait here for me, sweetheart. George: Poor kid. I’m really teaching her a lesson. Gracie: Well, I’m back, dear! All my errands are done. George: Hey, what’s in those packages? Gracie: Well, sure, so I’ll look my best! If I must go to prison, I don’t want to disgrace you. Gracie: I’ll be the belle of the cell. George: How did you pay for those things? George: But you promised you’d never sign your name to another check! You said you learned your lesson. Gracie: I did learn my lesson. This time I signed your name! Bill: Join us again next week when we’ll all be back. George Burns, Gracie Allen, Meredith Wilson and his orchestra, and yours truly Bill Goodwin. 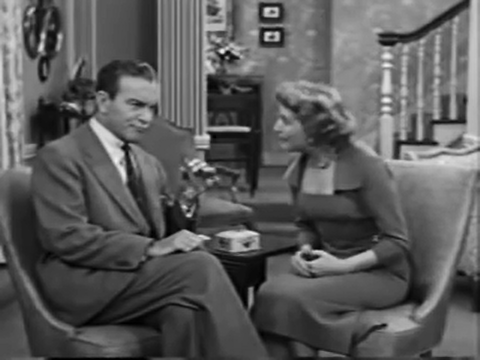 The George Burns and Gracie Allen show is written by Paul Henning and Keith Fowler. Until next Thursday, good night and good luck from the makers of Maxwell House, America’s number 1 preferred brand of coffee. Gracie: Always good to the last drop. George: Well Gracie, now you’ve really done it. Signing my name was forgery. George: You’re just heading one direction kid! Tehachapi! George: Gesundheit! I knew that. Good night everybody.